Roughly 30 years ago, I wrote a series of articles for Freshwater and Marine Aquarium magazine entitled “Light In the Marine Aquarium.” The article had been prompted by the then-new idea of reef tanks, and the limited selection of appropriate lighting systems. The problem was simply that hobbyists and the industry had not recognized the importance of light to a functioning ecosystem. After that article appeared, a long-running debate ensued regarding the “best” lighting system for a reef tank. The reef tank craze completely eclipsed freshwater aquarium keeping for a while, and all lighting technology was marketed toward that group of hobbyists. Today, with freshwater planted aquariums enjoying a resurgence in popularity, the lighting debate has been re-kindled, albeit with a different perspective. With that in mind, let’s take a look at what matters and what doesn’t in your choice of an aquarium lighting system. All photosynthetic organisms, whether they are Cryptocorynes or the symbiotic zooxanthellae that live in the tissues of hermatypic corals, depend upon chlorophyll to harness light energy for the manufacture of sugar molecules. Chlorophyll occurs in several molecular configurations, with the most universal one being chlorophyll a. All photosynthetic organisms contain chlorophyll a. The second most common form of chlorophyll is found in plants and algae, while the less common forms are found in different groups of micro-organisms, including cyanobacteria. Certain other pigments play a minor role in energy capture. We will confine our discussion here to chlorophylls a and b.
Pictured above is a graphic representation of energy absorption by chlorophylls a and b. 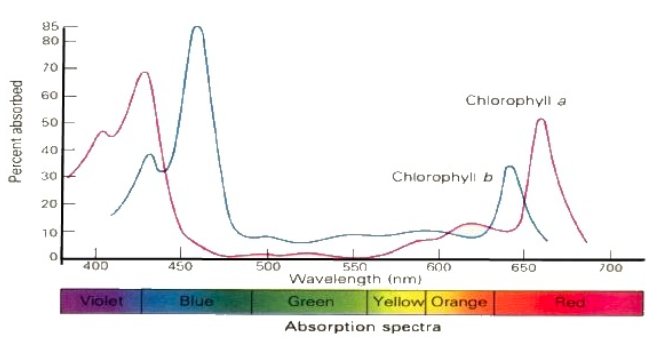 Note that most of the absorption is in the blue and red regions of the spectrum, with four distinct peaks, two for each type of chlorophyll. 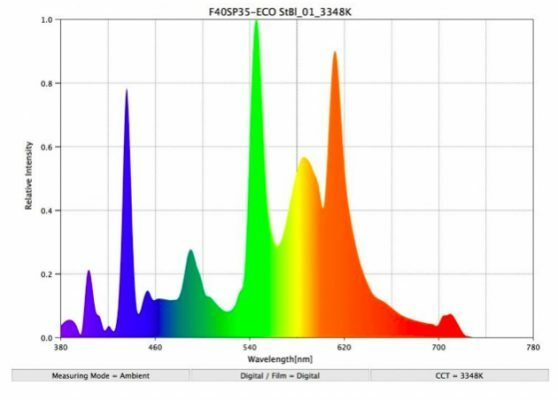 The second image presents the spectral output of a typical T5 fluorescent lamp. The details are not important, but note that not all of the light from this lamp is at the wavelengths absorbed by chlorophyll. This is the case with any type of artificial lighting, only a portion of the available light energy is at the wavelengths plants need. This opens up the question of how best to choose appropriate artificial lighting for a freshwater planted tank, or indeed any situation where plants are to grow without sunshine. The answer lies in a physical parameter known as “photosynthetically active radiation,” or PAR value. PAR value is reported as micromoles of photons per square meter per second,” and represents our best direct measurement of light output from any putative plant-growth light source. Watts per gallon—this is an outdated method that has obvious flaws and has been abandoned by serious aquarists. Kelvin temperature—a measurement of the color-rendering ability of a light source, as compared to natural daylight, that says nothing about the ability of the light to support plant growth. As a general rule, higher Kelvin temperature light sources emit a high proportion of their light in the blue wavelengths plants use, but they may also be deficient in the red wavelengths that are equally essential to plant growth and development. Lux—a measurement of light intensity that says nothing about the spectral quality of the light. PAR value can be easily determined by use of a PAR meter. Once prohibitively expensive, these instruments are now priced within the range of most hobbyist clubs and certainly most aquarium shops. In practice, a PAR reading of about 50 units at the level of the substrate directly beneath the center of the light source will support the growth of a wide range of popular aquarium plants. All PAR readings for aquarium purposes should be made with the sensor underwater. Manufacturers have capitalized on the lighting debate of the last three decades, and many now put spectral data, Kelvin temperature ratings and so forth on their packaging. My advice: look for the ones with PAR values on the package, or better yet, measure those PAR values yourself and then decide. This entry was posted in Lighting, Planted Tank Technique and tagged kelvin, par.